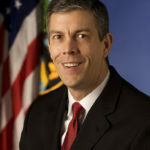 Arne Duncan was the United States Secretary of Education from 2009 through December 2015. While his tenure as Secretary was marked by some controversy (conservatives and some parents opposed his push for all U.S states to adopt the Common Core Standards to determine what students had learned, and teachers unions disliked his emphasis on the use of data from student tests to evaluate teachers and schools), he nevertheless enjoyed strong support from U.S.
President Barack Obama who praised his work at the Department of Education by saying, “Arne has done more to bring our educational system — sometimes kicking and screaming — into the 21st century than anybody else”. "A postsecondary education is the ticket to economic success in America." "Young people know how important it is for dads to be involved in their lives. As I travel the country and talk with students, some of them tell me that their lives would be totally different if their father was around." "Most teachers still say they love teaching though they wouldn’t mind a little more respect for their challenging work and a little less blame for America’s educational shortcomings." "Even in a time of fiscal austerity, education is more than just an expense." "I think every student needs access to technology, and I think technology can be a hugely important vehicle to help level the playing field." "Teachers say their schools of education did not adequately prepare them for the classroom. They would have welcomed more mentoring and feedback in their early years." "Research shows that children do better in school and are less likely to drop out when fathers are involved. Engaged parents can strengthen communities, mentor and tutor students, and demonstrate through their actions how much they value their children’s education." "State governments generate less revenue in a recession. As state leaders struggle to make up for lost revenue, legislatures tend to cut funding for higher education. Colleges, in turn, answer these funding cuts with tuition hikes." "There was nothing more important I could do than be supportive as a dad."